Tachyon Soulprint is a recent Healing modality developed by San Lau to facilitate wellbeing on all possible levels. It incorporates sacred geometry, toroidal energy and sound through connection with our unique soul blueprint. – Intro of use of Healing Cards (Open to everyone)! 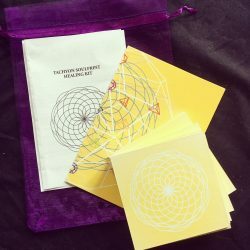 It incorporates Sacred geometry, Toroidal energy and Sound through connection with our unique Soul Blueprint. Using the Healing board, we select which Healing comes up and sends healing by specifying which dimension/ reality we are working on. It is individual hands on/off healing which is offered to those who wish to receive. During the healing, Toroidal energy is sent to the receiver and it aims to replace dysfunctioning limiting beliefs associated with the body area(s) with functioning and healthy beliefs and emotions. It also aims to enable cell rejuvenation and regeneration and activates self-healing mechanism. Furthermore, it helps clear energetic cords chips and implants. As torus is an ideal shape to attract photonic light, we have Toroidal DNA latent inside is to maximise the amount of light drawn into the body. Toroidal Touch helps to activate Toroidal DNA in certain areas, especially the Heart, Pineal Gland and in the primordial cells to attract Photonic light for DNA Evolution. This part enables us to speed up the rainbow body activation. This works on enhancing Connection and relationships with friends, couple, family members. It also helps tune the two people into the divine proximity frequency. It connects the two people’s toroidal energetic fields on the heart and brain level. – It helps align the Pineal gland, the heart and the primordial cells, as a mirror of the Galactic heart, the Human heart and the Earth heart. – It helps decalcifying the pineal gland and brings it to its optimal state. – It helps heal the heart, allowing us to heal the heartaches, releases knots, anxiety, tension, allowing us to open our heart on an emotional level, to be expressive, loving, and sentient human beings. – It connects the pineal gland with the heart, allowing more alignment between the superior intuition and the superior emotions. – It allows us to create parallel consonance, that is to be able to know what the other person thinks and feel, to enhance communication between one another. – It allows us to bring ourselves to our optimal functioning, on all levels, so that we can vibrate on a subtler level, and attract positive circumstances and make quantum leap according to the law of attraction. San Lau is a trained Sound Healing Practitioner who uses gongs, crystal bowls, Tibetan singing bowls, drums, tuning forks and voice in her private and group soundbaths. She recently created Tachyon Soulprint aiming to facilitate wellbeing through soul blueprint, sacred geometry, toroidal energy and sound.